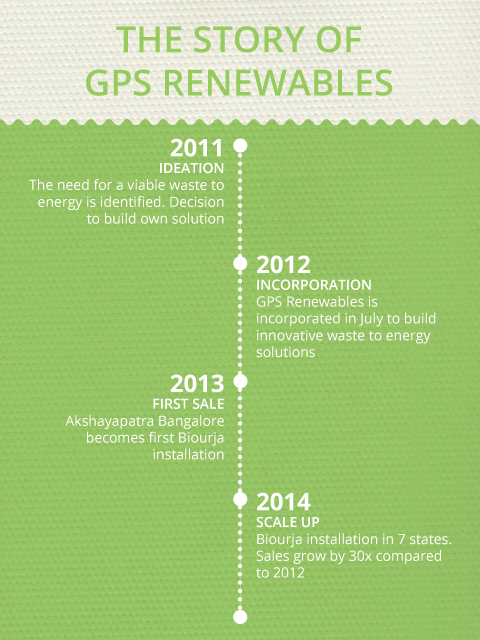 Founded in 2011, GPS Renewables is a waste-to-energy technology company that is pioneering the development of clean and low-cost technology for waste management solutions. Biourja is GPS Renewables inaugural product and is arguably the first viable bio-waste to energy solution for urban establishments. GPS Renewables is dedicated to building innovative technology products and services to handle waste in the cleanest possible way while still providing excellent economic returns to its clients.